[ Qoreader Blog ]: [Monthly Note] Things I've....Papers of Things. [Monthly Note] Things I've....Papers of Things. Its long time to updating this blog. I know that blogging is not a trend anymore. There are many alternative ways for showing your existence on Internet. Anyway, I've got a new idea for making my life become more precious*at least on my mind. 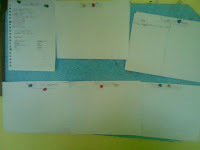 I've made some scrap of papers which it will be write with my things that I've did, visited, dreamed, watched, made etc. P.s: Sorry for my broken grammar, i am still learning and trying to rise my English writing.